In his newest adventure, the irresistible Skippyjon Jones swings out of his closet and into the spectacular Cirque de Ole, where his pals, the Chimichango gang, perform feats of derring-do. There are many acts to see, but only Skippito the Strong can perform the trickiest stunt of all. Judy Schachner's vivacious art and riotous text make for mucho read-aloud fun. 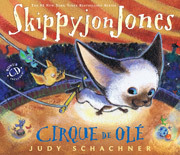 Come one, come allwith Skippyjon Jones as the circus star, the Greatest Show on Earth just got even better! Includes a CD of the author reading!